Fowler, Thomas. 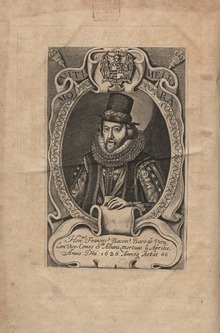 Bacon, Francis (1561-1626). (编) Stephen, Leslie. Dictionary of National Biography 2. London: Smith, Elder & Co: 328–60. 1885. Bacon, Francis. The Essays and Counsels, Civil and Moral of Francis Bacon: all 3 volumes in a single file. B&R Samizdat Express, 2014. Andreae, Johann Valentin. Christianopolis. Description of the Republic of Christianopolis. 1619. Spedding, James; Ellis, Robert Leslie; Heath, Douglas Denon. The Works of Francis Bacon, Baron of Verulam, Viscount St Albans and Lord High Chancellor of England (15 volumes). London. 1857–1874. 本條目出自公有领域： Adamson, Robert; Mitchell, John Malcolm. Bacon, Francis. (编) Chisholm, Hugh. 大英百科全書 3 第十一版. 劍橋大學出版社: 135–152. 1911年. Farrell, John. 6: The Science of Suspicion. Paranoia and Modernity: Cervantes to Rousseau. Cornell University Press. 2006. ISBN 978-0801474064. Heese, Mary. Francis Bacon's Philosophy of Science. (编) Vickers, Brian. Essential Articles for the Study of Francis Bacon. Hamden, CT: Archon Books. 1968: 114–39. Rossi, Paolo. Francis Bacon: from Magic to Science. Taylor & Francis. 1978. Serjeantson, Richard. "Francis Bacon and the 'Interpretation of Nature' in the Late Renaissance," Isis (Dec 2014) 105#4 pp: 681–705. The George Fabyan Collection at the Library of Congress is rich in the works of Francis Bacon.